This past Tuesday was such a treat for me. 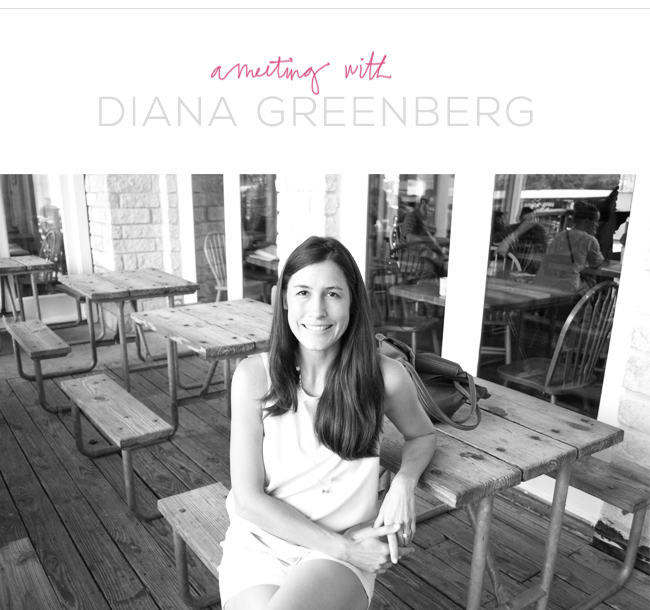 I had the pleasure of getting to know Diana Greenberg, an Austin-based abstract artist whom I met a week beforehand at an anniversary grand opening party at Canopy, a co-working space for creatives in East Austin. Awestruck viewers grasping glasses of wine were continuously filling Diana's studio of vibrant color and serene patterns, and I couldn't help but immediately be reminded of one of my very favorite artists, Mary Ann Wakeley, as a looked at the paintings before me. I was spinning around in circles in search of the artist who created the captivating paintings, and I noticed a beautifully-poised woman with soft dark hair, clad in an airy, white sleeveless button up, khaki shorts, and the exact same pair of Sperry sandals that I own. I quickly learned that all the gorgeous artwork was created by no one other than her, and her name was Diana. Diana, accompanied by her sweet and supportive husband (don't you love the men who go to their wive's / girlfriend's events??) talked to Clay and me for quite a while about Diana's work and getting started in the art scene, and just as I wanted to tug Clay's sleeve in an effort to let all the other interested visitors have the chance to talk to Diana, she exclaimed, "We should get coffee and talk more!" 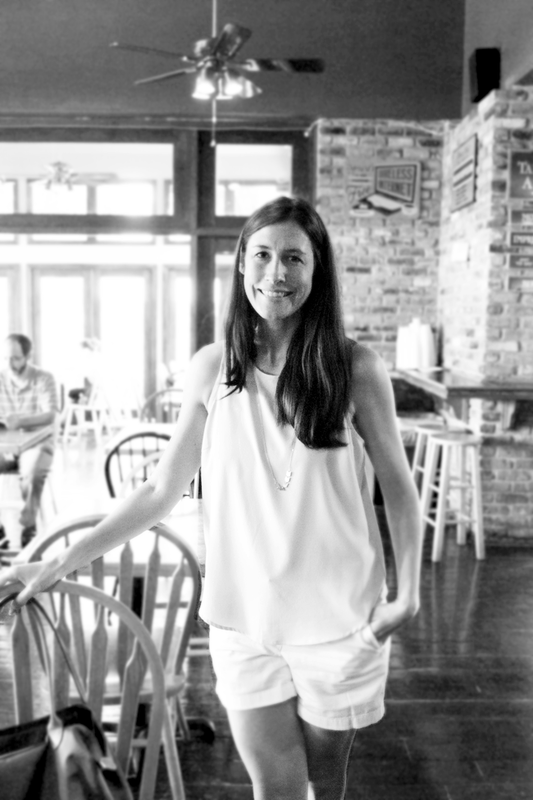 Although Diana now splits her time between raising two little ones of her own and rushing off to one of her two studios in Austin, she has a background in marketing, boasting a degree from the University of Texas. 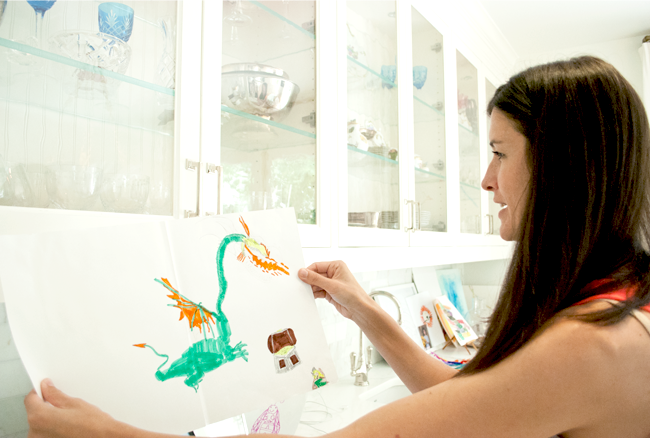 She has lived in beautiful cities including San Francisco and Dallas, working for the likes of marketing at Neiman Marcus, and she even headed her own stationary company, in which she illustrated cakes and lingerie, in addition to other various works of art. As an artist who likes the "quick painting" nature of acrylic, I was enamored by Diana's perseverance of using oil by choice, painting layer upon layer. Diana told me about one of her paintings that took 10 days to dry (which is actually short for oil paints! ), and she had put in the living room to dry. Unfortunately, her daughter came up with oil-covered hands, minutes later. 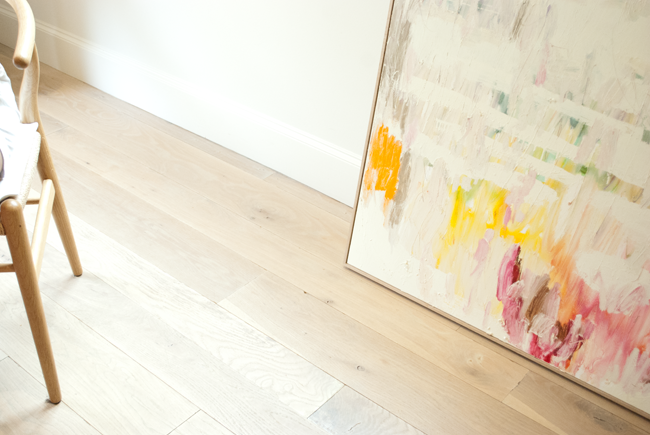 "I don't know what I was thinking, hanging an oil painting to dry there!" Diana smiled, recalling the look on her daughter's face. …But I mean, seriously, you guys. I think if I had kids this adorable, I would have A LOT of trouble trying to convince them not to stick their hands in virtually anything that's supposed be drying. Diana told me that her kids are oftentimes the inspiration behind her paintings; sometimes, she can visualize a finished piece, and if her busy schedule allows, she rushes to her studio to try and capture the fleeting image. 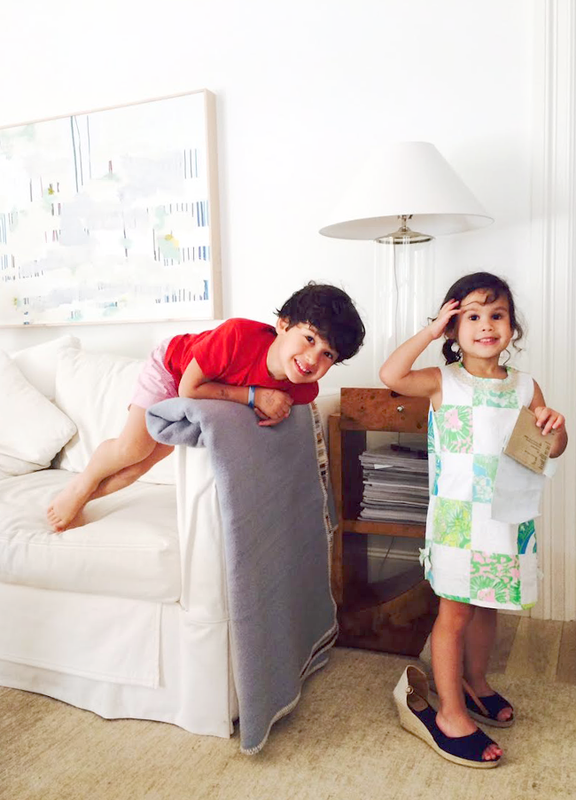 Following their mom's footsteps, Diana's kids have taken to art, and their pieces are lovingly strewn around their home. 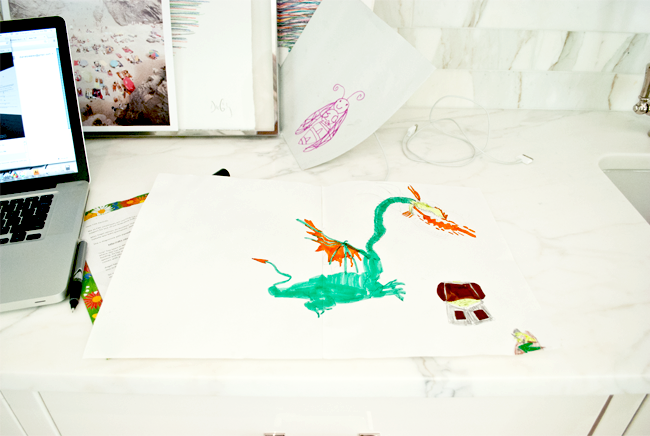 Side note: isn't that a spectacular dragon? Her son is FIVE, you guys. The happy little bug isn't shabby, either. In addition to her paintings being inspired by her kids, Diana is also influenced by a range of art including japanese woodblocks and various works created by Patrick Herron, Pierre Bonnard, Vincent van Gogh, and Willem de Kooning. "As artists, we have a lot of trouble comparing ourselves to another artist and thinking our own work isn't as good, but when it comes to great musicians, do you think they compare themselves to other musicians in completely different genres? It's all about finding your voice and developing that path." A big thank you to Diana for allowing me to share this heartfelt meeting! Y'all have an awesome weekend! 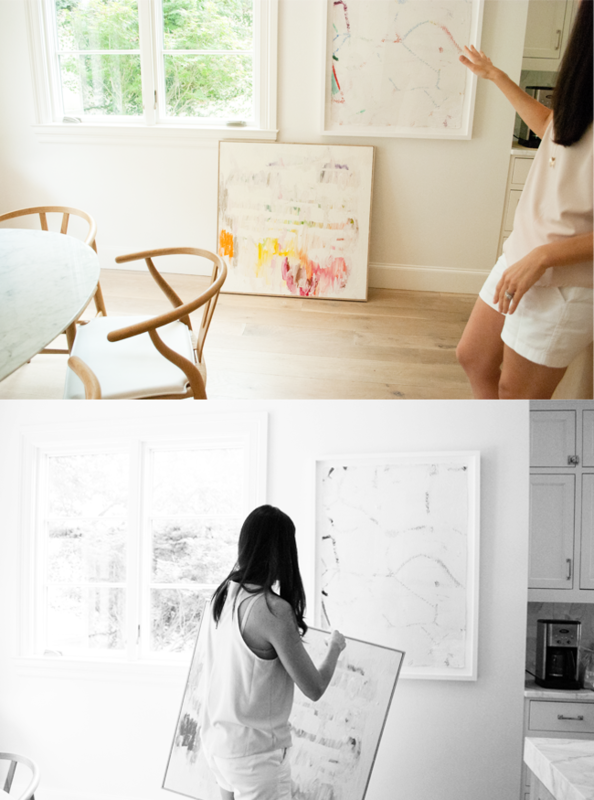 Gosh, her paintings are gorg!